This is a lovely premiere disc recital which will give immense pleasure, not only for the playing of Elisa Netzer but also for its imagination, reaching well beyond what might have been safer choices. The unifying element is the theme of the toccata, itself something requiring great skill in any instrumentalist. But if that were all, we might expect only virtuosity, when there is so much more than that on display here. The opening arrangement of Scarlatti declares Netzer’s gifts. There is a combination of clarity and balance, so that quieter passages are integrated into the whole, and there is a sense of overall architecture. The two brief works for children, by Khachaturian, are delightful, the Toccata the marginally darker of the two, with some tough emphases, especially in lower registers and in the last forty seconds. Paradisi returns us to eighteenth century charm, and Netzer is able to capture something of the brightness of the harpsichord while maintaining a firm rhythm – a most enjoyable little piece. Turina’s Op.50 presents very different challenges through its varied moods, with strong Spanish flavours. The demands of Zabaleta’s arrangement are admirably met. This music has genuine substance as well as technical difficulty, yet this performance is poised and confident. The earlier works on the disc are all arrangements: Ami Maayani’s Toccata was written specifically for solo harp. The opening and end are marked by strong chords, while the middle sections are rapid, requiring virtuosity. I think this is the first work I have heard by the Israeli-born composer. I struggled a little to find a very distinctive voice, but six minutes is not really enough to judge by, and there are some striking effects. Virgilio Mortari was, like many of his Italian contemporaries (think of Respighi in Ancient Airs and Dances), fascinated by earlier Italian musical forms, and his little neo-classical Sonatina prodigio is a brief but charming work in three movements. The central canzone has a lovely hesitance about it, while the final toccata has many moods within a tiny compass. Stephan Hodel is a Swiss-based composer who writes principally for large ensemble, but who wrote this for Netzer’s final recital at the Royal Academy in London. Various effects are evident, obtained by touching the soundboard, scratching or hitting strings and random use of the pedals. For all that, the work is quite melodic and rhythmical, with much to give pleasure. It is good to be reminded that Nino Rota was so much more than a talented film composer. His two movement Sarabanda e Toccata makes a lovely conclusion to the recital, the Sarabanda rather gentle throughout, despite changes of mood, superbly realised here. 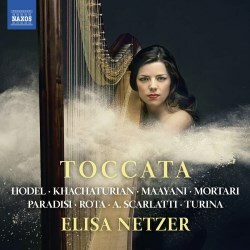 The recording is wonderfully clear, complementing both the music and the skill of the splendid Elisa Netzer.